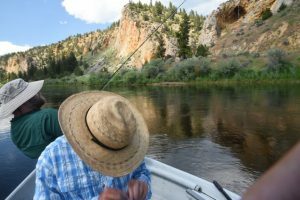 Jonathan and Terry fishing and guiding on the Big Hole River. July and August – Tricos, Mayflies, Moths:Tricos and tiny mayflies, start erupting along the Big Hole in the summer months. These tiny flies become a substantial hatch for hungry trout. With a little luck and a little cloud cover they offer wonderful dry fly fishing opportunities. 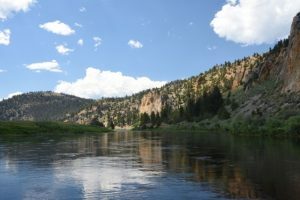 Another signature hatch on the Big Hole are Spruce Moths enticing trout to the surface. This hatch can be seen on the entire length of the river, creating 153 miles of angling bliss.